Leicester is well known in the UK as a multicultural city. 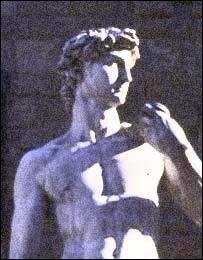 But few people realise it is home to the world's only centre dedicated to researching one of Italy's most famous regions, Tuscany. Even Tuscany itself does not have such a centre. The Centre for Tuscan Studies is part of the University of Leicester. Director George Ferzoco said the centre was created after academics across various disciplines learned they were all studying aspects of Tuscany. Since launching last year, the centre has enjoyed great success and support from authorities in Tuscany. Mr Ferzoco says: "We have entered into a great collaboration with the regional (authorities) in Tuscany. "The people there have been extremely helpful both in terms of man hours and money spent." Introducing an annual conference held in Tuscan towns with addresses by leading academics. Establishing a study day in Leicester where scholars share findings and ideas about the Italian region. An annual lecture where a leading Tuscan figure visits Leicester. Encouraging further study of the region. The university's Centre for Football Studies has started exploring parallels between Leicester City and Fiorentina football clubs. Other departments at the university exploring Tuscany include archaeology, history and sociology. Work is progressing to start student exchanges. Asked why the world's only centre dedicated to Tuscany is in Leicester, Mr Ferzoco says: "Because we had the idea first. "In Tuscany, there are a lot of places dedicated to specific studies of aspects of Tuscany. "But no-one had the idea of an overarching centre covering the whole region. "I think that is why the people in Tuscany are getting behind what we are doing." Furthering the bond between the East Midlands city and Italian region was the launch of a book by Leicester artist Douglas Smith earlier this month. 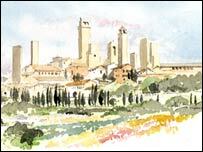 Mr Smith, who has had a love affair with Tuscany since honeymooning there 44 years ago, has released a book of his painting and sketches from the region. Mr Smith says: "I fell in love with the place and have been holidaying there ever since." As an artist, Mr Smith says he is captivated by the "terrific quality of light". "And when it comes to art and architecture, Italians are always capable of doing the small things, the details, so well."